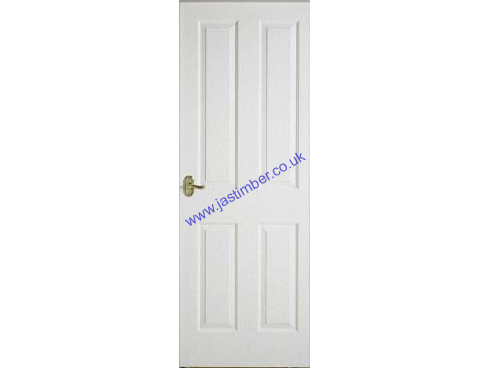 White Primed Moulded Panel Fire Doors at affordable prices. White Primed Door designs with Raised & Fielded Panel Masonite type doorskins with a recessed moulding, on both sides. Solid firecheck core - Classic 4 Panel door design. Raised & Fielded panel pattern door skins (both sides). White primed for paint finish. Timber is a natural material - variations in knots, colour and grain should be expected. or PM-Mendes Door Care & Warranty - Mendes Timber doors have a copy of the manufacturer's instructions included in the packaging. - IT IS THE PURCHASER'S RESPON­SIBILITY TO CHECK THE SUITABILITY OF THIS FIRE DOOR &­ IT'S CERTI­FICA­TION,­ IN CONJUNCTION WITH THE DOOR-SURROUND, HARDWARE & THE SITUATION OF USE. - We cannot cancel or exchange any Fire Door after order - Durador Fireshield Doors are a Special Order. Carrier Delivery of Premdor Fire Doors is not possible. E. & O.E. see T&C - We do try to keep prices and specifi­­cati­­ons of PM-Mendes 4 Panel White Primed Firecheck Doors correct, but mistakes can happen!